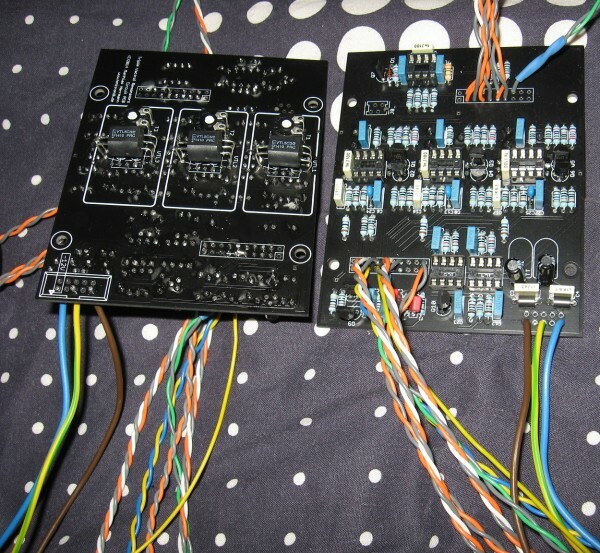 I have finished a test panel design for my 2 triple resonator pcb's that Matthias posted over to me . In order to get the 2 resonators squeezed onto a single skrog panel ( 100mm x 250mm) I have decided to leave off the individual audio in's & out's and just keep the single in & out sockets for each resonator pcb , a switch on the left near the bottom will switch the audio routing from 2 resonators in series ( input to in1 / output at out2) / 2 separate resonators / 2 resonators in parallel (1 audio to both in's & outputs at both out sockets) . I have populated both pcb's and now ready to wire the connections , I think I will print off the simple black & white layout and glue to a test panel before ordering the final blue sticker . more pics as the build goes on . Finally got the wires attached to the 2 pcbs , one thing im not sure about is the J8 terminals on the pcb, the boards are going on a big format panel (250mm X 100mm) , should I leave the J8 as is in the pic ? . Sorry for the late reply. i must have missed the notifications for the latest posts here! Now got the front good sticker on the panel and the hardware fitted to the 250mm X 100mm X 3mm panel , more sockets due in the post soon to finish the panel , then it's wiring up time . im just trying to design a panel for my version. i got the circuit working (sounds great mattias, thanks!) but no panel. 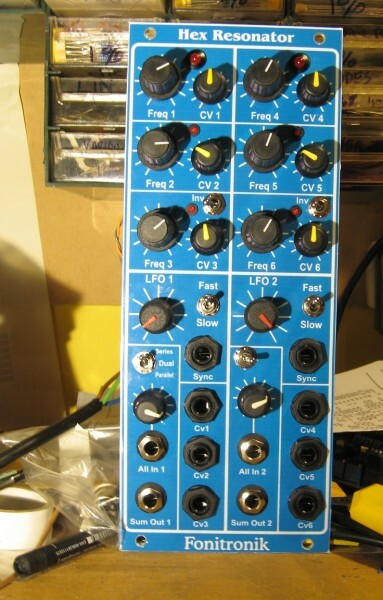 i think i still have one of the first eurorack prototype panels somewhere. could this be helpfull? For me? No thanks, I do MOTM format stuff. thanks anyway! To save a couple of patch leads I installed a on/off/on toggle switch for different modes . Parallel = filter 1 & 2 both fed from audio input 1 ( a veroboard non-inverting buffer was used to copy 1's input to 2 input) . Dual = 2 separate filters. Series = audio into filter 1 input , audio output from filter 2 output. The un marked switch on the lower mid right is an after thought , switched to the left = all cv inputs receive LFO 1 , switched to the right is separate lfo's. Why are there 5mm leds on the top 2 and the rest are 3mm leds ??? 1 mp3 :- Sequenced vco saw with no resonator , Fades into saw with 1 triple resonator. 2 mp3 :- Seq saw to 2 resonators in Parallel mode , changing both Lfo speeds. 3 mp3 :- Still in Parallel mode but LFO 1 sweeping all 6 cv inputs. 4 mp3 :- Series mode resonator 1 fed into 2 , adjusting controls. 5 mp3 :- Series mode , a Korg X5 general midi standard strings sound fed into the resonators. Thanks Matthias , I really like this module , I can see me using it for modular & normal keyboards too , fantastic .